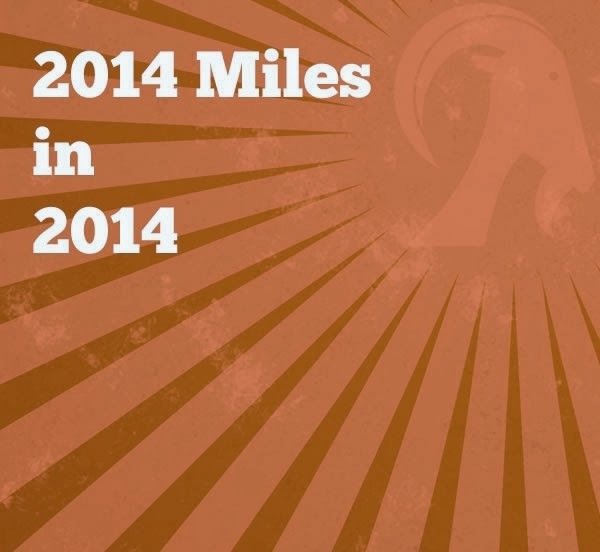 2014 miles in 2014 - May update! Only 1188.63 miles to go! Only 502.93 miles to go! 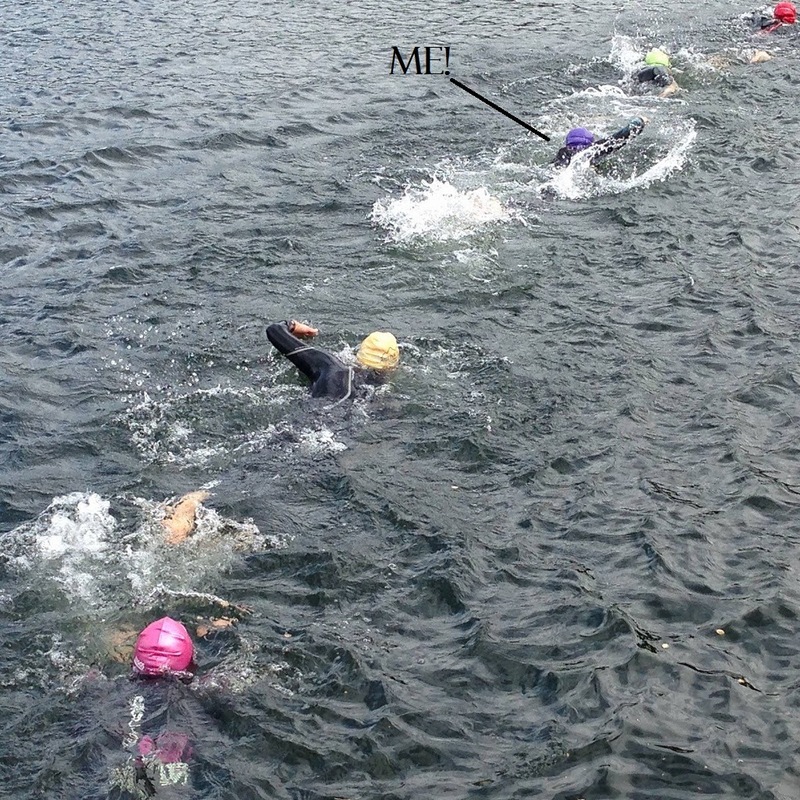 Last night I somehow survived my second swim in Lake Windermere! 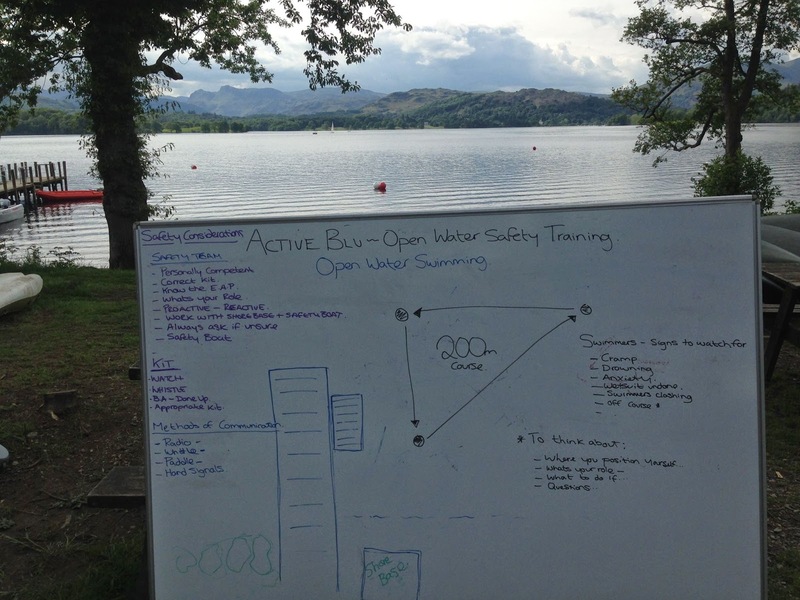 It was an organised training evening for those who wanted to practise open water swimming in the safety of an organised group. 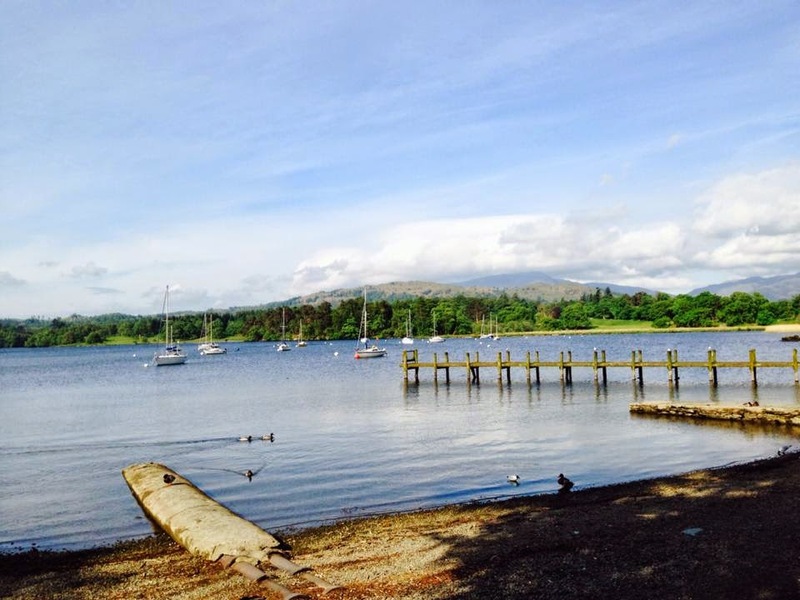 I travelled the 30 minutes to Brockhole, Windermere with a friend from the tri club and felt extremely apprehensive despite it not being my first time! In actual fact I don't think I felt any calmer at all than I did on Saturday! Once we got there we registered and got our swimming band before wrestling into our wetsuits! For safety everyone got a band before they entered the water and had to return the band and be signed out on exiting the lake to ensure everyone who goes in comes back out! 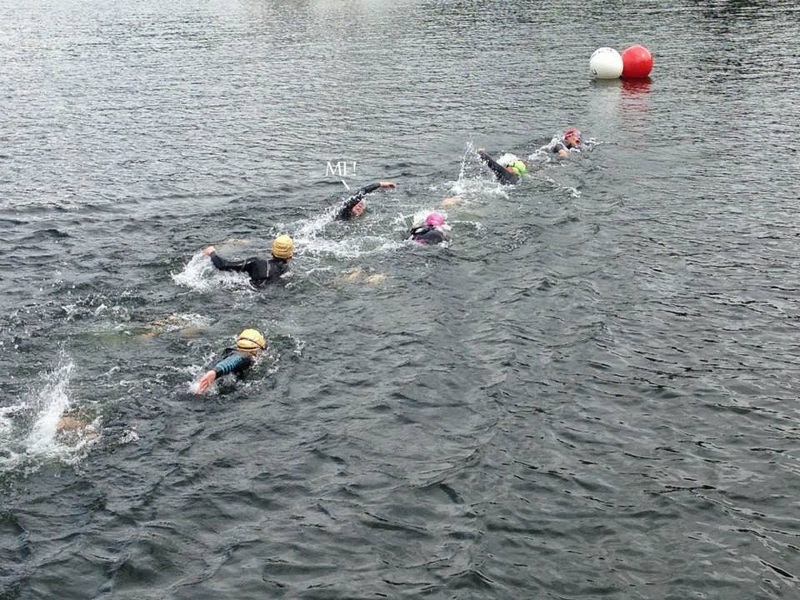 There was a large group of swimmers and for the majority this was their first open water swim of the season so everyone was feeling slightly nervous! We had a safety briefing before being allowed into the lake. When it was time to go I decided to hang back and let the more confident swimmers go first before getting myself acclimatised to the water temperature. Initially in order to calm my nerves I swam to the first buoy in breaststroke so that my breathing was regulated before attempting front crawl. Once I braved doing crawl I was surprised how much calmer I felt than I did on Saturday. After doing a complete 200 metre circuit I had a short rest before setting off again. I did a total of 4 circuits which is 800 metres which is half a mile! I definitely need more practise with sighting as without a black line to follow I don't swim in a very straight line! The session passed without incident and I got out the water after 35 minutes or so before I got too cold and whilst I was feeling positive! Up until now I have borrowed a wetsuit but I am feeling so positive after this session that I will actually enjoy OW swimming that I have ordered my own wetsuit! I will be swimming the channel before you know it! Despite only swimming 800 metres which is a lot less than I do in the pool my arms and shoulders are really aching and stiff today and I feel absolutely exhausted! It is incredible how much OW swimming takes it out of you compared with pool swimming! I think I need to get to the gym to strengthen my arms and shoulders! Sunny days Oh, where have you gone? Rain you don't stop me! Still did a 5 mile run! 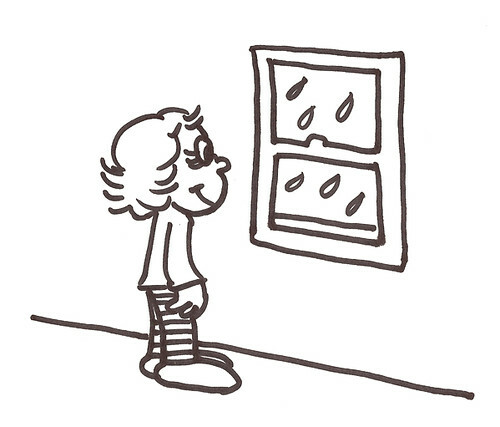 This morning I got up to the unwelcome sound of rain pelting against the window! My plan was to run early in the day as I had a lunch date with an old friend and didn't fancy running on a full stomach! As the rain was so heavy I Googled the forecast for the rest of the day - to learn that it was pretty much set to continue! By 9.30am I decided just to do it! I put my three quarter pants and running vest on with my running waterproof jacket on top and set off! I decided that since I hadn't done my usual speed work yesterday with the tri club (it wasn't on this week with being half-term!) that I would do a little bit today instead! So after a 1.5 mile warm-up run I did the 1 mile river loop that I used a couple of weeks ago for a sprint effort! My legs felt like lead and I was a little wary because the pavements were wet and slippery in places with a scattering of blossom however I was determined to do my best. After the 1 mile loop I did a 2.25 mile recovery run home. I was surprised to see that I did my 1 mile loop in 7:42 which is identical to what I did it in last time despite the rain and feeling slow and sluggish today! My warm up 1.5 mile was at an average pace of 8:46 minute miles and my recovery was an average pace of 8:49 so I'm pleased especially after doing the half marathon on Sunday and then swimming yesterday! I must do more speed training and hills after all I have an incredible PB to beat now! Yikes! Look what the Postman delivered this morning! After receiving my Great North Swim pack I decided that I needed to go swimming this evening to get some lengths in! The pool was busy and there were lots of slow people in the lane I was swimming in so I had to venture into the fast lane before I lost my patience! I did sets of 10 lengths and was pleased that I managed 2600 metres /104 lengths /1.61 miles in 1 hour 2 minutes! My logic is if I can swim further than a mile in a pool I can swim a mile in a lake! Here's hoping I'm right! Liverpool Rock 'n' Roll Half Marathon! On Sunday I ran in the Liverpool Rock 'n' Roll Half Marathon and had a fabulous day! My first Open Water Swim! Today I swam for the very first time in open water! 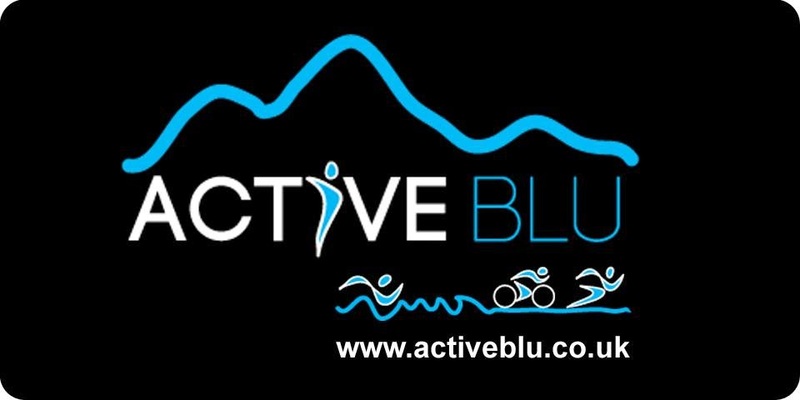 with a company called "Active Blu" to gain the skills and knowledge needed to survive my "Great North Swim" challenge in a few weeks time! 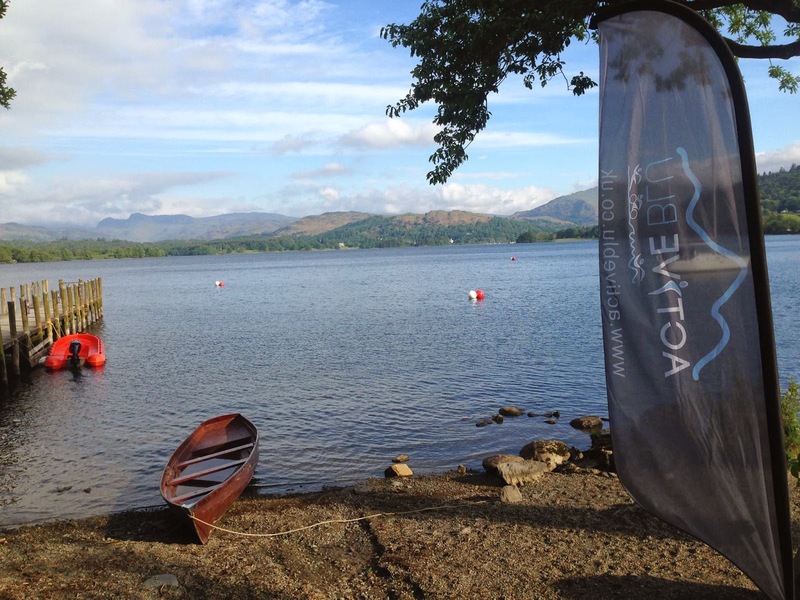 The course started at 9.30am and was based at Brockhole on the shores of Lake Windermere. I am very fortunate to live just a 30 minutes drive from this idyllic location and I arrived bright and early feeling extremely nervous and apprehensive! The weather forecast hadn't looked good but the good fortune gods must have been looking down on me as it was infact a bright and sunny morning! I don't think I could have coped with a choppy lake in the rain! There was just 6 of us in the group and very surprisingly we were all females! Emma, the coach from Active Blu leading the course started off telling us what we would hopefully gain from the experience and the itinerary for the morning. Just as she was getting into the flow of things the fire alarm went off! Emma was unaware of any alarm checks being carried out so we had to vacate the premises! Once we had trudged down all the stairs to assemble outside we were informed that it had just been an alarm check and they had forgotten to tell us ... this did absolutely nothing for the nerves! So back up the stairs we went and we were then asked to introduce ourselves and say what we hoped to learn and how we felt about OW swimming! 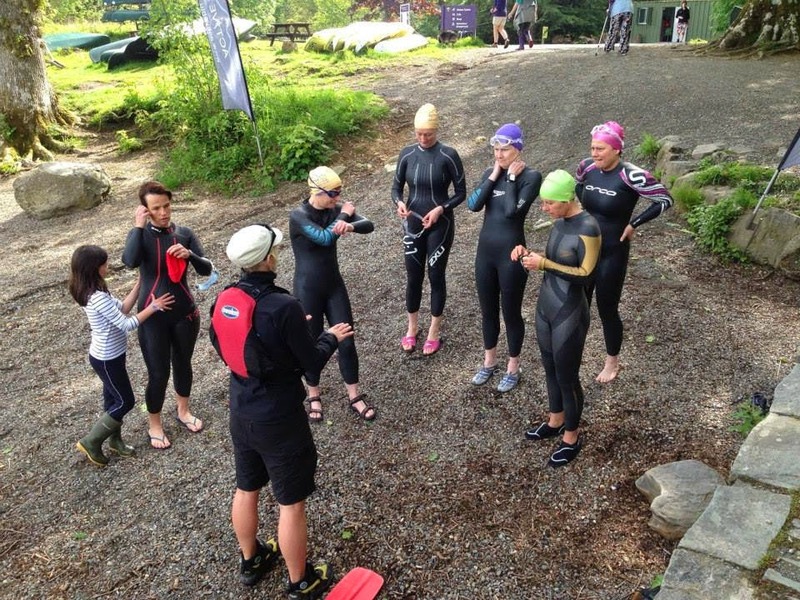 Once all the introductions had been done and our anxieties shared it was time to struggle into our wetsuits! As I don't have my own I was borrowing one for the course from Emma. She gave me an extra small men's to try and it was a perfect fit although slightly difficult to get into when you don't really know what you are doing! Once were were all togged up we set off down to the lake shore! I don't think I have ever felt more scared in my life! I am in the purple hat - my face says it all! What was I doing and more to the point why?! Emma explained that the water temperature was around 13C and therefore it would feel exceptionally cold! We started off by paddling in up to our knees before splashing our hands in the water and dripping water over our necks and face to get accustomed to the temperature. The bed of the lake was extremely rocky and very difficult to walk on so it was easier just to get in the water and swim rather than staggering around getting sore feet! I braced myself and sunk down into the water before starting to swim. The water obviously WAS cold, but I didn't get the "take your breath away" feeling I had anticipated. All week I had truly prepared myself for torture so the reality wasn't too bad! We did a few floating and sinking exercises to show us that our wetsuits wouldn't let us sink even when we wanted to! Then it was onto the real stuff - swimming! I could feel the nerves starting to get the better of me and my breathing started to become laboured so I had to really focus on my stroke to try and remain calm! Once I stopped thinking so much it all became a lot easier! such as sighting, "pack swimming" and drafting! On the day I will be happy just to swim! We spent about 50 minutes in the lake and I didn't feel cold at all until I got out! My fingers and toes were shockingly white but once I got into the hot shower and had struggled out of my wet suit I was OK! I expected to spend the rest of the day shivering but once I was dressed (in many layers!) I very quickly warmed up! So I survived my first Open Water swim! I am going to another training session on Thursday evening - I need all the practise I can get before the BIG event! 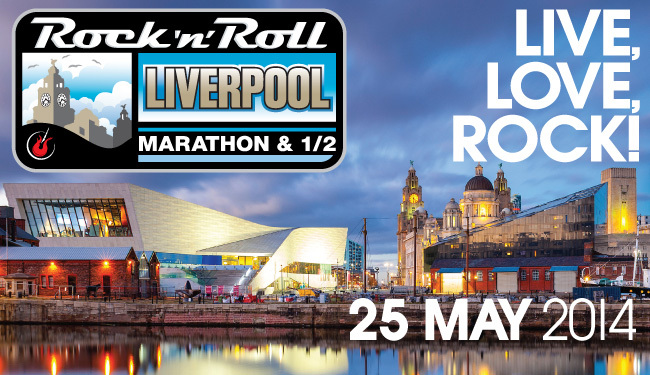 Tomorrow I have Liverpool Rock 'n' Roll Half Marathon! I think I must have used up my quart of nerves this morning because I feel very chilled and relaxed about tomorrow's race! After all, there is no reason to panic ... it's dead easy to breath whilst running and you can't drown! Tonight I went swimming to try and gain some confidence for my first Open Water swim on Saturday! The pool was fairly busy but I managed to keep going despite the annoying obstacles of people chatting at the end of my lane! If people want to chat why don't they go into the main pool where they can chat without getting in the way of other swimmers! Anyhow, after a 150 metre warm up I managed to swim 4 sets of 500 metres, and then finished with a 350 metre warm down! In total I swam 2500 metres or 1.55 miles or 100 lengths in 1 hour and 11 seconds! 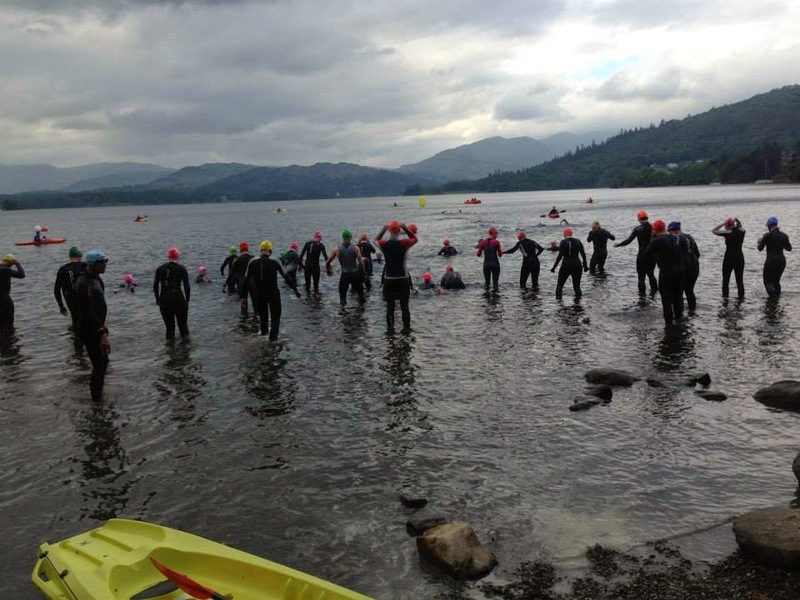 I know I can do the 1 mile distance of The Great North Swim but can I do it in a lake? I will get a better idea on Saturday! Tonight I went to a "Transition Training" session with the Tri Club! After a busy day at work followed by a course I was exhausted and not really in the mood to practice getting dressed quickly! However, I said I was going so I thought I had better turn up lest get a black mark against my name! If it helps to shave some time off my currently very slow transition time it will be worth it! Off I set wearing my tri suit, taking all my necessary kit with me! We practiced group riding skills, mounting and dismounting skills and running with the bike! We also got advise on how to set up the transition area properly and the order in which to put equipment etc. My mounting and dismounting skills leave a lot to be desired and I need a LOT more practice, however I did rather pleasingly master running with the bike holding the seat! We then practiced the swim to bike transition (pretending we had just run out the pool! ), getting dressed, running with bike to mounting area, cycled a short circuit before dismounting and running back with bike to then practice the bike to run transition! We did this several times. All in all it was a very useful exercise and I feel much more confident with my transition skills albeit I still need lots more practice! Today I received my race bib number for my first ever trail race! This has made me feel even more nervous about it! Tonight I went running with the Tri club! We were supposed to be going up a local hill called Scouts Scar but due to the impending thunderstorm it was decided it would be safer to stay on level ground and go along the river instead, which is the same route we did last week! We could hear the thunder in the distance and the sky looked very black and threatening but we managed to get around the 6.2 mile route without getting wet so we were rather chuffed! I found it an easier run than last week despite it being the same route mainly because we kept at a steady pace whereas last week we did speed intervals which nearly killed me on the uneven ground! However, it was exceptionally hot and humid! Just as I got home the heavens opened and we had torrential rain! Today was my "Off The Couch" running club at school. Today was a very hot and humid day and the plan stated a 3 minute run followed by a 45 second walk repeated 7 times. 8 runners turned up but none of them seemed very enthusiastic or bouncing with energy! Once we got going it became apparent that today was not going to be a very successful run! I think the heat had drained them of any positive vibes and they were full of moans and groans! We did manage to complete the run albeit with slightly longer walk breaks and shorter runs but we still managed to cover 2 miles! Hopefully they will get some bounce back for next time! They had been doing so well up to this point, I hope this isn't going to put them off! I tried to reason with them and told them that it felt difficult because of the heat and if they persevered over the coming weeks it would soon start to feel easier - I'm not sure I got through though! Later in the evening I went to the tri club swimming training! The focus was on technique with drills! I find these difficult to do but needs must! One breathing exercise I really liked was bilateral breathing with a difference - it was 3 strokes then breathe then 1 stroke and breathe on same side again, before repeating on other side! I kept a rhythm going but got in more air so felt calmer! Perhaps I should have done this during the triathlon swim when I was panicking!! I must remember it when I am next stressed in the water!!! We ended up doing 1850 metres which is 1.15 miles or 74 lengths! I am beginning to think I must be ever so slightly insane for agreeing to this! Currently the water temperature in Lake Windermere is approx 10C!!! I could end up with hypothermia - that's if I escape drowning! I was amazed but delighted to wake up to another day of sunshine equating to another hot run! I set off with my drink in hand hoping to maintain a 8:40 minute mile pace! I set the virtual pacer on my Garmin and tried to keep up with him! The main problem with this is when you are greeted with hills it is very difficult to maintain the pace which means working extra hard to catch up once at the top! The route I had chosen had quite a few hills and it was an incredibly hot morning so I was pleased to have managed a 8:49 average pace (slightly slower than my original intention but pleased with it none the less!) over 7.53 miles. In the afternoon I did a 4 mile walk in order to do a recce of suitable off road tracks to run on! Tomorrow is my "Off the Couch" running club - here's hoping they turn up! It was a very hot morning and with the bright sunshine coming through the window I woke up early despite being out last night! After having breakfast I set off in the car to where I planned to start my run. I parked in a car park that has a big Aerial mast near it! This was intentional so when I was running and became disorientated I could follow the mast to guide me back to the car! I get lost so easily I need these little landmarks! The aim was to do an 8 mile off road run! There was no one else around when I set off and didn't see a soul during the entire run! It was so peaceful! Every time I go off road running it surprises me how much harder it is than road running and my pace is much slower although I feel like I am putting more effort in! However, the rewards of the views makes it all worthwhile. Today was exceptionally hard as it was very hot with no breeze but thankfully I had remembered my drink! I used the excuse to take photo's to have impromptu rests! I was pleased that there appeared to be no cows around BUT when I was on my way back a field had filled with cows in the space of an hour! The Farmer was obviously having a laugh and I had no choice but to brave it! If the cows had been there on my outward run I would have gone a different way but now in order to retrieve my car I had to do it! Luckily the cows obviously thought it was too hot too as they never moved as I ran passed them!! I really must stop comparing my pace to my on road pace! It just doesn't work! I will hopefully get some road running in tomorrow to remind my legs what it's like to go that bit faster! Today, I had an amazing day! We went on a school trip with year One to Grisedale Forest and went on a Gruffalo hunt along a Gruffalo trail! The first challenge board asked the children to move like the various animals in the story - they loved stomping like a Gruffalo the best! We then played hide and seek behind the trees - the adults hid and the children found us ( we didn't want to risk the children hiding so well that we couldn't find them!). We also made animal dens and did some woodland art along the way! I was rather disappointed with the actual Gruffalo at the end - I am sure they could have made a better effort! However, the kids all had a great day and were very well behaved (we walked 2 miles and there was no complaining!) and as an added bonus the sun shone on us too! When I got home I was on such a high from having so much fun I even had the energy to go for a run! Unfortunately, it is recorded as 2 separate runs! One which is only 0.78 miles and the other is 4.16 miles totaling 4.94 miles! I am going out tonight for a meal with friends from work but I realised once I was home that I didn't have any money to go out with so decided that I would stop off at the cash point machine on my run killing two birds with one stone. However, not being totally confident in the workings of my new Garmin yet I mistakenly pressed stop instead of pause hence why I have 2 runs for one! Not that it matters! For my short run I did 8.34 minute miles and for my long run I did 8.37 minute miles. I was particularly chuffed to have maintained the pace on the longer run as there was a rather steep hill in the middle that nearly killed me off! It was a very hot afternoon and I didn't take a drink with me which was a mistake as I was gagging by the time I got home! Hoping to do a long off road run tomorrow - here's hoping the sun is still shining and I don't have too much of a hangover to contend with!! !